“I wish that were true” She whispered sadly, pointing the gun to her head. “I’m sorry! I don’t know why I can’t stop laughing! You must think I’m a terrible person!” Salma leaned back in her chair and giggled. This was her second therapy session and she was still refusing to come to terms with her grief. “I don’t think you’re a terrible person Salma. I’m more interested in what you’re thinking,” I replied. “Sometimes inappropriate reactions are a sign of denial. Perhaps you’re not fully absorbing what had happened to your best friend,” I said slowly. “SURPRISEEEEEEEEE!” All the girls yelled when the bride-to-be walked into Salma’s living room. “Oh my God!” she exclaimed. She covered her face then whirled around to hug her best friend Salma with sparkling eyes full of love and gratitude. They called her ‘Supa’, a shorter ‘British accent’ version of her nickname ‘Super Girl’. No one knew how and when she got it, but given her kindness, smartness, talent, beauty and courage, it suited her perfectly. She really was a super girl. “There’s a website?” Supa’s jaws dropped. “Umm yeah! Now let’s get going. They’re waiting for us in the car. You don’t want to be late and get on your future mother-in-law’s bad side on the very first dinner!” Salma warned. “I still get nightmares about that car accident. The very same night Supa was thanking Allah for His blessings, she lost everything! She’s in such bad shape, no one is allowed to see her. Why? Why is life so messed up and cruel and mean?” Salma cried. “It is, isn’t it?” I asked. “So you think if you had loosened up a bit or dressed provocatively, you would have been married by now too?” I asked cautiously. “Why do you do it then?” I asked. “Do you believe in the ‘Choco-Purpletine theory’?” I asked. “I don’t even know what that is. How can I believe in it?” Salma snapped. “No! I firmly believe in Allah and His existence. Nothing you say can possibly change that!” Salma replied. “If you believe that Allah is Unfair, Unjust and likes to see us suffer then I’m sorry to say you don’t really know Him. And like you said, you can’t believe in something you don’t know. The first pillar of faith is ‘Belief in Allah’. Not just in His mere existence; but also in His Lordship, His right to be worshiped alone and in His Names and Attributes. You say you do everything exactly the way you’re supposed to do it, except it doesn’t mean anything if it’s not from the heart. Like traffic rules, we do them exactly the way we’re supposed to do them. We stop at red lights because we are obligated to do so; it’s the law. Parking on the side to help an old woman or remove a blockage from the road; that’s humanity. Acts with sincere intentions are what purify our hearts and bring us real joy. That’s the difference,” I said. “So you’re saying Allah allows evil only because good things will come out of it?” she asked, tilting her head. “What good could possibly come out of Supa’s disability?” Salma wondered. Salma walked out of my office completely captivated, I think she stopped blinking! She went home that night and whispered a silent prayer. It had to be silent; for no one knew the secret she’d been keeping from her best friend. Belief in Allah is the first pillar of true faith, tell us how did the belief in Allah, His Names and Attributes help you have a positive and productive outlook on life? 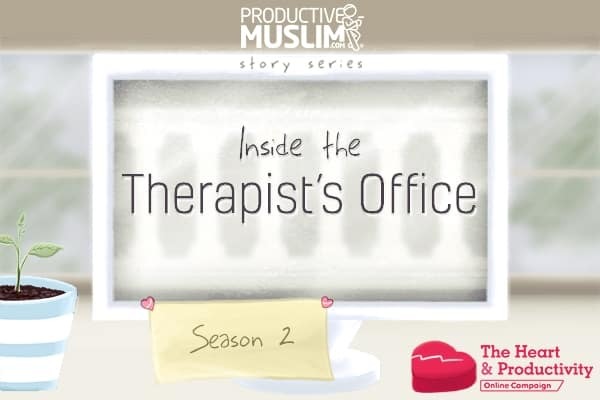 Stay tuned to Part 2 of this series, and you can also read Inside the Therapist’s Office Season 1 for more insight on the pillars of Islam.